Family friendly house with lots of extras. Springfree Trampoline, Kayaks, Games and Toys, loads of room and lots to do. 5 bedroom, 3 bathroom home, with extensive desks. Stunning view of lake and mountain. Safe and spectacular local beach (Cliff Road Reserve) only 300 metres way. Quiet end of Spencer Road, safe for walking, close to park and excellent fishing locations. Fish smoker provided. Off road parking for small or medium sized boat (up to 5.5 metre). Parking options for larger boat available close by. Close to boat ramps. House layout, 3 bedrooms , with bathroom and ensuite upstairs. 2 bedrooms and bathroom downstairs. Open plan kitchen, dining and living areas. Great for two families. Double garage with internal access. Decks front and back. Partially covered back deck so sit outside and BBQ in any weather. Large 5 burner BBQ with Hood. Family friendly, lots to do, Large spring free trampoline, 2 small Kayaks (life jackets available), Aluminum dingy with oars. Lots of Games and boxes of toys for the young ones. Sandpit, paddling pool, swing ball, Boogie Boards, a range of blow up water toys. TV is free-to-air SkyTV service, or bring your own card to provide your normal channel access. Stairs has gate for toddler safety. Safe garden for kids. Bush gully for older kids to explore. Glow worms at night. Climb into the DOC reserve behind for spectacular views. 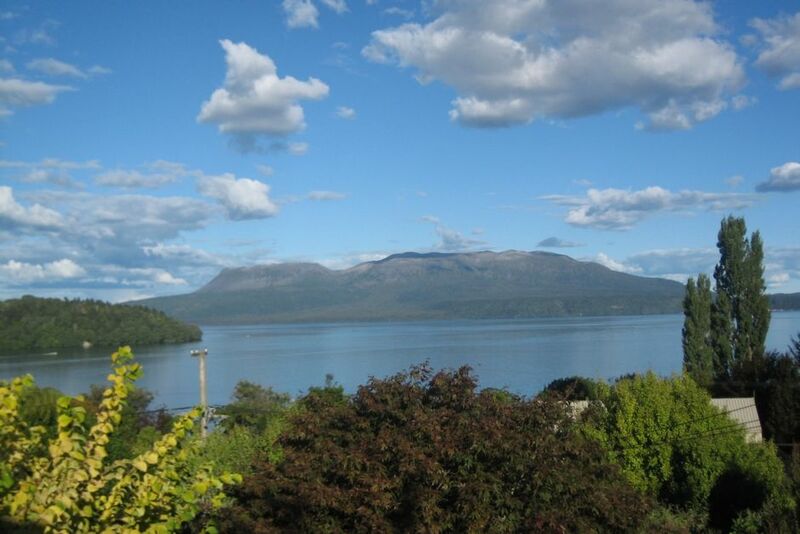 Fishing, boating, swimming, walking, history – Tarawera has it all. Rotorua hosts many events 2W, W4, 3D, Nduro, Tough Guy and Gal, Multi-sport, Cycling, 100k Flyer, Half-ironman, Rotorua Bike Festival, Crankworx. $90 cleaning fee at end of stay. Pets allowed with prior approval and special conditions apply. Credit card payments are available if this is preferred. Minimum Stay extends on holiday week-ends and week-end rates apply. Oil heaters in bedrooms (4), plus large wood burner with firewood provided. Well stocked to the point where you can bake if you wish. Tea, coffee, salt, pepper, sugar provided. Basic TV with Sky (free to air channels only). Satelite dish based access. Great place for big family get a ways. Huge place with great facilities. Really close to the lake. Really enjoy our stay. We booked the house for a large group of friends for a long weekend of boating and couldn't be happier. It is not the flashest house but that was not what we were after. It is perfect for hosting a large group with a really big open plan kitchen / lounge / dining communal area (the photos doesn't do it justice) and plenty of beds. We loved sitting around the covered outdoor BBQ area in the evening and the view is stunning. This property suited our two families perfectly - a lovely view overlooking the lake with ample room to spread out and a very user friendly kitchen space. Clean and tidy, comfortable bedding, great access and a fantastic location at the quiet end of the road just a few minutes walk to a lovely quiet beach on the lake side - definitely somewhere we would love to use again, thank you so much! Views to-die-for. The house was perfect for our group (4 couples and 1 child). The kitchen warriors among us appreciated the plentiful crockery, cutlery, serve-wear and utensils. It made catering to a big group a breeze. Love the kayaks and paddling on the lake was absolutely magical. The smallest of us appreciated the collection of toys as well as the trampoline. All-in-all we loved the spacious relaxed living flowing out onto the decks both front and back. Would love to come again! Lovely home and lovely and quiet. We had 10 staying and the house was perfect for that many. The open plan dining and lounge area works really well with a lot of people. Great property, great size and very handy open plan layout for a large group.